"One Roof" is a campaign that aims to raise awareness about domestic workers’ rights. This campaign is a product of a partnership between the Social Work Society of Kuwait and the Human Line Organization in collaboration with the Ministry of Interior. 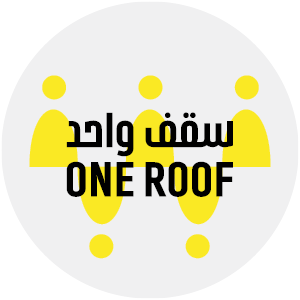 "One Roof" campaign will provide a complete, precise, and sufficient legal guide to all domestic workers and their employers in an effort to reduce the conflicts that might ensue between sponsors and workers due to their unfamiliarity with the current laws that regulate domestic work in Kuwait. Through pamphlets printed in 15 languages, lectures, panel discussions, short videos and a media campaign, to be geared on a national level, both sponsors and domestic workers will learn more about their rights and responsibilities within the current institutional and legal framework. This campaign moreover aims to change social perceptions and attitudes toward domestic workers to ensure tolerance and justice for all those who live in Kuwait. To ensure that all domestic workers and employers are familiar with the Kuwaiti laws and procedures pertaining to domestic workers' rights. To lead society towards accepting domestic work as an occupation, which requires regulation by laws and policies. The Human Line Organization was established in 2012. It is a civil society organization committed to enhancing and advocating human rights. The organization works on raising awareness, providing training on human rights concepts and procedures, legal observing of human rights violations, and the preparation of human rights reports. It also aims to provide solutions to these violations and further the culture of tolerance, peaceful coexistence, and constructive dialogue. Spread the culture of human rights between all segments of Kuwaiti society. The Social Work Society (SWS) is a Kuwaiti civil society founded in 2005 that focuses on protecting, supporting, and providing services to victims of human rights violations and those who have been marginalized and subjected to unequal or selective applications of Kuwaiti laws. Through provision of social services, legal representation, and promoting policy reform SWS aims to ensure that basic rights of vulnerable groups are supported and recognized in accordance with international laws and standards. To abolish the “Kafala” system of private sponsorship and provide legal and social services to migrant and domestic workers.